A. 20µg total protein of cultured HeLa cells and human melanoma cell lines SKMEL28 and A375 were separated on an 4-20% polyacrylamid gel under denaturing conditions. B. 20µl, 10µl, and 5µl of 1:5 diluted extracellular vesicle (EV)/exosome solution from C57BL/6 mice were separated on an 4-20% polyacrylamid gel under denaturing conditions. CD63 (upper portion of the image) bands were revealed as described in the protocol section with ABIN2169630 diluted 1:150000 as secondary antibody. 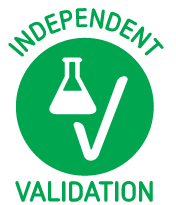 Read validation report #100056 for application Western Blotting. Mouse serum was collected from C57BL/6 mice and lysed in 6M Urea/20mM Tris. Exosomes were extracted with ExoQuick reagent (SBI, product #EXOQ5A, lot #140624-001) following the manufacturer’s protocol and resuspended in 30µl of modified RIPA buffer. 20µl, 10µl, and 5µl aliquots of 5-fold diluted exosome solution were used. Samples were denatured in Bio-Rad Laemmli sample buffer (product # 1610737, lot #t350001755)containing beta-marcaptoethanol and separated on 4-20% Bio-Rad TGX gel (product #456-1034, lot #t64041496). Transfer onto PVDF membrane (Millipore, product #IPLF00010, lot #R5EA5898E) was done on TransBlot SD apparatus (Bio-Rad) following manufacturer’s protocol. Block membranes with LiCor Blocking Buffer (product 927-40000, lot V1381) for 2h. primary CD63 antibody ABIN1440014 at 4°C diluted 1:500 in LiCor Blocking Buffer at 4°C overnight. primary rabbit anti-CD9 antibody (Proteintech, 20597-1-AP, lot 00013334) diluted 1:500 in LiCor Blocking Buffer at 4°C overnight. Wash 4x 15min with PBS-T.
Incubation with secondary antibody LiCor Donkey anti-Goat IgG (Heavy & Light Chain) Antibody (IRDye680RD) secondary antibody (antibodies-online product number ABIN2169630, lot C50330-03, 1:15000 dilution) and incubated on a shaker for 1h at RT. Three rinses plus four 15min washes—2 PBS-T, 2 PBS (as required by LiCor). Blot was developed on a LiCor imaging system (Odyssey 9120, scan resolution: 169um, image quality: low). Incubation with secondary antibody LiCor Donkey anti-Goat IgG (Heavy & Light Chain) Antibody (IRDye680RD) secondary antibody (antibodies-online, ABIN2169630, lot C50330-03, 1:15000 dilution) and incubated on a shaker for 1h at RT. 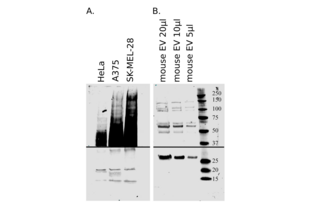 Experimental Notes The donkey anti-Goat IgG (H&L) IRDye680RD-conjugated secondary antibody ABIN2169630 works successfully in Western blot to reveal goat IgG pirmary antibodies used on human cell lysate and prepared mouse serum exosome samples. Based on ELISA, this antibody reacts with the heavy and light chains of goat IgG and with sheep IgG. Cross-Reactivity (Details) This antibody was tested by Dot Blot and/or solid-phase adsorbed for minimal cross-reactivity with human, mouse, rabbit, rat, chicken, guinea pig, hamster, swine, and horse serum proteins, but may cross-react with immunoglobulins from other species. Characteristics Blocking buffers and antibody diluents made with bovine serum albumin (BSA) and dry milk may contain IgG that reacts with anti-bovine IgG, anti-goat IgG, anti-horse IgG, and anti-sheep IgG antibodies. This can lead to a significant increase in background and/or reduction of secondary antibody titer for protein detection applications. Product cited in: Alayev, Berger, Kramer, Schwartz, Holz: "The combination of rapamycin and resveratrol blocks autophagy and induces apoptosis in breast cancer cells." in: Journal of cellular biochemistry, Vol. 116, Issue 3, pp. 450-7, 2015 (PubMed).